Are you a person who gets annoyed by all the talk about positive thinking and positive psychology? Do you secretly wish I and others in my field would turn down the happy? If you pride yourself on being a critical thinker or know that you are an introverted thinker, researcher Gabriele Oettingen’s work known by the acronym, WOOP, is for you. Each new year seems to bring with it obligatory goal setting. I suspect that you have suffered through weeks of conversations about new dreams, new hopes, and bigger goals. I also suspect you are now sitting back and waiting for everyone to prove you right – positive thinking and talking DO NOT help you achieve your goals. In a few weeks, all those big talkers will surrender and get back to business. Science actually supports you. Science has also found a way to satisfy your critical thinking AND help you achieve your goals. That is what it means to WOOP it up. Articulate a Wish + Describe in detail the desired Outcome achieved when the wish has materialized + Describe in detail all the Obstacles to achieving your desired outcome + Make a Plan to overcome the obstacles and plans to achieve the desired wish = WOOP. 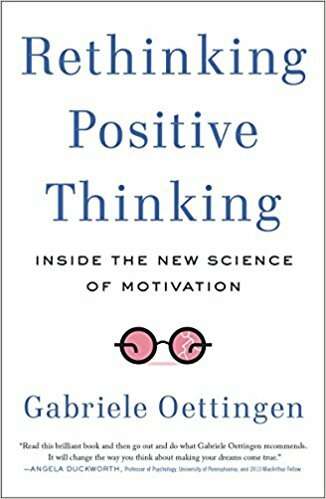 Oettingen’s work is backed by extensive research and easily digestible in her book, Rethinking Positive Thinking. A faster way to learn the method is to watch this explainer video created by Oettinger’s WOOP lab. I will warn you ahead of time. 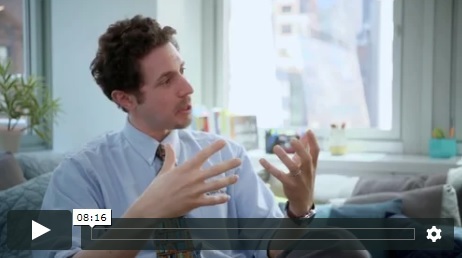 This video is designed for those ready to do real work, at a slower pace, so the steps are learned and understood. Lastly, take a look as Oettingen works with someone I perceive as introverted to see what the process looks like in real life. 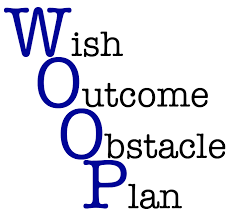 Before I close, let me connect what WOOP has to do with PERMA and The Business of Flourishing: Whether you are introverted or extroverted, the key variables of PERMA (positive emotions, engagement relationships, meaning, and achievement) are the same. Continually finding ways to shift your thinking from a stuck or blocked position to one where you are building toward any and all of the variables of PERMA will increase your potential well-being and life satisfaction. Simply, PERMA holds the pieces. 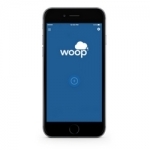 WOOP is one of the ways to access the pieces more easily. Easier is better!